Hot shot test pilot Hal Jordan (Ryan Reynolds) is skating on very thin ice. During an important demonstration he crashes his plane and blows a defense contract. This forces Carol Ferris (Blake Lively) The Vice-President of Ferris Aircraft to ground Hal. Or so she thinks. Hal is whisked away by a glowing green bubble of energy to a crashed alien space ship. The pilot of the ship is Abin Sur (Temuera Morrison) an honored member of The Green Lantern Corps, an intergalactic peacekeeping force 3600 strong who police the known universe. Abin Sur gives Hal his power ring which can create or do anything its wearer can visualize. Abin Sur is dying and he sent his ring to find a successor. The ring has chosen Hal. He barely has time to let all this sink in before the ring snatches him far into space to Oa, the home planet of The Green Lantern Corps and their immortal masters, The Guardians of The Universe. 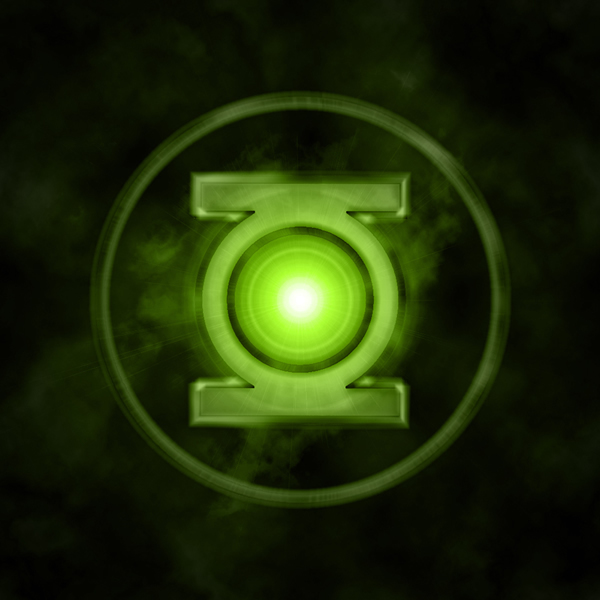 Once on Oa, Hal is trained how to use his ring by Tomar-Re (voiced by Geoffrey Rush) and Kilowog (voiced by Michael Clark Duncan) under the watchful and distrustful eye of Corps Leader Sinestro (Mark Strong). Hal is the first human ever to have been inducted into The Corps and Sinestro makes it quite plain he doesn’t think the brash, irresponsible Hal can make it in his beloved Corps. But they don’t have much time to get him battle ready. Abin Sur crashed on Earth because he was fleeing from Parallax (voice by Clancy Brown) Once a Guardian himself, Parallax harnessed the energy given off by fear and himself became a creature capable of destroying worlds with that power. He escaped from the prison planet Abin Sur locked him away in and now Parallax is on his way to Oa to destroy The Corps and The Guardians. But first he’s got to stop off and have Earth for an appetizer. Notice that so far I haven’t mentioned the Hector Hammond subplot. That’s because I didn’t like it and thought it completely unnecessary to the story. We’ve already got more than enough with establishing Hal and The Green Lantern Corps. I’d much rather the movie had spent more time on Oa with Tomar-Re, Kilowog and the rest of The Corps. When we’re out in space with Hal the movie snaps, crackles and pops. But when we get back to Earth and we’re stuck with the antics of Hammond and the boring-as-boiled-cotton romance between Hal and Carol a lot of the energy goes out of the movie. That’s not to say that the movie has bad performances. Peter Sarsgaard as Hammond and Angela Bassett do their best with what they’ve got to work with and they’re actually very good, even though it’s totally unnecessary for Amanda Waller to be in this movie. They could have given her scenes and lines to Hammond’s dad (played by Tim Robbins) and it would have worked much better. I liked Ryan Reynolds a lot as Hal Jordan/Green Lantern. I’ve got friends of mine who say they don’t like him because they see him as cocky, arrogant, hyper-confident and maybe that’s true. But it also makes him a helluva lot more interesting to watch up there on screen than a mopey Tobey Maguire whining about not being able to pay his rent. The acting honors I’d have to give to Mark Strong. Even knowing what Sinestro eventually becomes, I was impressed by how Mark Strong was able to give a depth of honorable nobility and commitment to his belief in the Corps and The Guardians to Sinestro. But Blake Lively…sigh…if she had any kind of artistic integrity, she’d give the check back. Is her performance that bad? Yes. Yes it is. And even though I stay away from 3D movies as if they were Ebola, I did see GREEN LANTERN in 3D and I was honestly surprised at how much I liked it. When the movie was in outer space I thought the 3D worked well. Superhero space opera like GREEN LANTERN is the kind of stuff that 3D should be used for and they suckered me in with it. I haven’t enjoyed a 3D movie so much since 2008’s “Journey To The Center of The Earth” I’ve read other reviews that dump on the movie for having too much CGI but for a movie like GREEN LANTERN I don’t think there’s such a thing. Hey, it was worth the price of admission just to get scenes such as Sinestro addressing the entire Corps and see all the various alien Green Lanterns taken straight out of the comic books. The director Martin Campbell has done way better movies (his two James Bond and two Zorro films) but he’s got nothing to be ashamed of here. I really appreciate directors like Mr. Campbell who know how to direct action scenes so that we know exactly what is happening, who is hitting, who is being hit and why. So should you see GREEN LANTERN? I say Yes. Despite the disappointing ending and the unnecessary Hector Hammond subplot and the boring performance of Miss Lively, the movie is faithful to the spirit of the character and that’s enough for me. I think part of the reason that Reynolds plays himself so often is that’s what made him popular in the first place. So he keeps getting typecast as himself. I think he could have played the character more like Hal from the comics but it was probably the studio who wanted him to play himself. I’m actually grateful for that, because I hate Hal Jordan but I know I’m in the minority in that. My main problem with the movie was Parallax. I hate the yellow fear monster version of that character. I did think some of the CGI was unnecessary. I didn’t think the mask needed to be CGI for example. Oh, certainly, Ryan Reynolds CAN act. I’ve seen it. I think it just depends on how much HE’S into the role. He’s a guy who’s more than comfortable collecting a paycheck, phoning it in and doing what he does. I don’t even begrudge him that. However, the trailers are a good litmus test…as far removed as the character Reynolds plays is from “Ryan Reynolds” will signal how much faith he’s got in the movie. If the actor cares, it’s likely a good flick. I somehow have it stuck in my head that Ryan Reynolds is going to be the 21st Century’s Burt Reynolds: most of his movies he’s going to be playing himself with occasional roles where he’s going to demonstrate talent that takes people by surprise. We’ll see if time proves me right or wrong. Know what this movie and the director Martin Campbell did that was absolutely unforgiveable? Right in the middle of the very first time we hear Hal say the Green Lantern Oath, it cuts away to Hector Hammond having a fit. They should have saved Hammond for a second GL movie. See, I felt that again, Ryan Reynolds was playing Ryan Reynolds. I agree that it is more interesting than your typical Hal Jordan, but I feel like we’ve been supersaturated with this character and we’re able to have an enjoyable film without it. The subplot with Hammond is absolutely wasted, useless. The constant jumping around from Earth to Oa muddled the film (and it didn’t help that the special effects all looked ridiculously plastic)…am I space opera? am I an action flick? It doesn’t help that Thor did the jump back and forth between Earth and Asgard much, much better, and less disjointed. Makes Green Lantern seem…amateurish. If it weren’t for Mark Strong (who is always bloody fantastic) and a brunette Lively, I would have been thoroughly bored. To those who complain about January Jones in First Class, ha, give her an Oscar if her only competition is Lively. As much as I think a brunette Lively does exactly what the film makers wanted it to do, I can’t help thinking that should a sequel be made that Star Sapphire is inevitable and if so, I’d rather they have gone with someone like, oh, Monica Bellucci. Hey, a guy can dream, can’t he? And you’re gonna need someone who can act if they’re going to wear…that. Anyway, rambling, as usual, but bottom line, Green Lantern was a SyFy channel like story, that despite its SFX budget still looked cheap. It was competently directed, and acted in spots; a completely valid timewaster where folks can go, shut off their brain and probably enjoy themselves. The problem being, the big budget SFX hero film has become a fierce competition over the last couple of years and Green Lantern doesn’t stack up well beside any of them. At least it’s better than Transformers.